Commission for the Marriot Renaissance Hotel, 606 Congress St., South Boston, MA. 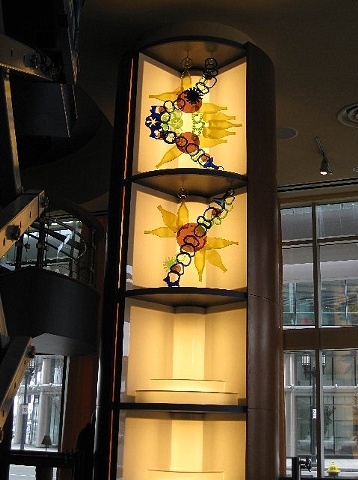 Installed as part of a bar designed by Wendy Brown, with lighting designed by Kris Selles. The central cylinder is about 5' diameter and 16' tall. It's divided into quadrants. The glass is in the top two shelves of two opposite quadrants.